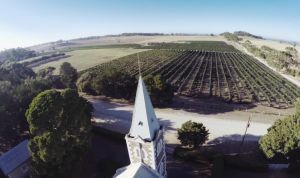 The Henschke family has been making wine since Johann Christian Henschke planted a small vineyard on his diverse farming property at Keyneton in 1862. He was one of many Silesians who had fled their homeland in search of religious freedom, and he arrived from Kutschlau in 1841. The wine was initially intended for consumption by family and friends, but with the first commercial release in 1868, believed to be principally riesling and shiraz, the wheels were set in motion for greater things to come. Each generation has built upon the foundations of Henschke. In more recent times, fourth-generation Cyril Henschke pioneered varietal and single-vineyard wines at a time when blended wines and fortifieds were in vogue. His greatest legacy was the creation of Hill of Grace and Mount Edelstone in the 1950s, shiraz wines from Eden Valley that have captured the red wine world’s imagination. Today, it is fifth-generation Stephen Henschke and his wife Prue at the helm, passionately upholding the family name and reputation. This highly regarded team has won a multitude of awards that recognise the complementary nature of their roles - Stephen as winemaker and Prue as viticulturist. One of the most notable things about the couple is their ability to keep devotees fascinated. While they are perhaps most famous for Hill of Grace and Mount Edelstone, they continue to surprise with their new styles and techniques. Prue’s meticulous, innovative viticultural management has seen not only new life breathed into the venerable vines, but also a new direction given to white winemaking that their forebears could never have imagined. Henschke boasts a strong portfolio, with a focus on ultra-premium single-vineyard wines. They maintain their ‘Exceptional wines from outstanding vineyards’ by sourcing additional fruit from growers of excellence, from the Eden Valley, Barossa Valley and the Adelaide Hills regions.